At least nine people confirmed that they had seen the strange monster on a farm in Flatwoods. Their statements were similar, but some argued that the mentioned creature had a heart-shaped head, and other that it had some kind of heart-shaped helmet. Some thought that was an alien. 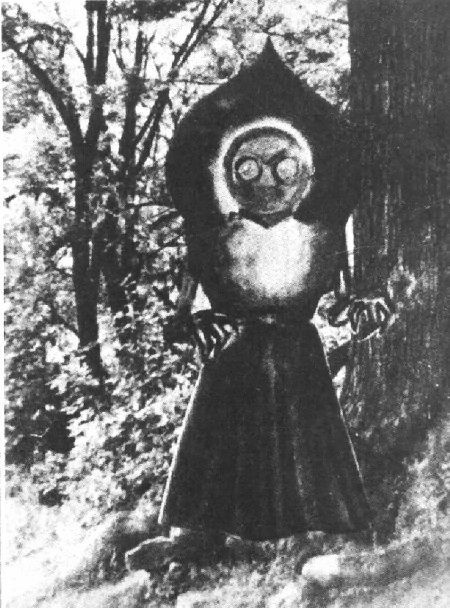 On this day in 1952, several people in the United States confirmed they had seen the strange creature – known as the Flatwoods Monster. Some thought that was an alien or a cryptid (a being that lives on Earth, but hides from people). They saw the monster in the wild near the town of Flatwoods, West Virginia. The witnesses agreed it was at least two and half meters tall, had a red face, green body, and bulging and non-human eyes. The witnesses described its head as either shaped like a sideways diamond, or as having a large circular cowling behind it. Allegedly, the body of the creature was similar to a human body, and had something akin to a dark skirt. Some said that the creature had no visible arms, and some that it had long, stringy arms which protruded from the front of its body, ending in long, claw-like fingers. The first unusual phenomenon which witnesses saw was the luminous object, which crossed the sky at 7:15 PM. Two brothers – Edward and Fred May – and their friend Tommy Hyer (ages 13, 12, and 10 respectively) saw this object, which appeared to come to rest on land belonging to the local farmer Bailey Fisher. The boys went to the home of Kathleen May, the mother of two brothers, and told her what they had seen. She organized a survey, invited a local member of the National Guard, Eugene Lemon (17), and two other children. They came to Fisher’s farm, and saw a large pulsating “ball of fire”, with a diameter of about 15 meters. The guardsman saw two small lights on the left side. He pointed the flashlight at them, and saw the creature. It emitted some strange sound, moved toward them, and then toward the red light. They were afraid of the creature, and ran away. The mother called the local sheriff, who noticed a disgusting smell of burning rubber and metal, but found nothing else. After questioning people in the town, it was found that one mother and her 21-year-old daughter had also seen the creature a week before the mentioned people saw it. This experience was very stressful for her daughter, and she was hospitalized for three weeks. It has remained unexplained what happened on this day in 1952. The luminous object which crossed the sky can be explained as a meteorite, but it is more difficult to find a scientific explanation, despite many attempts in the last 60 years.